As U.S. President Barack Obama and Chinese President Xi Jinping prepare for their first summit on Friday, tensions between the publics of these two superpowers are on the rise. 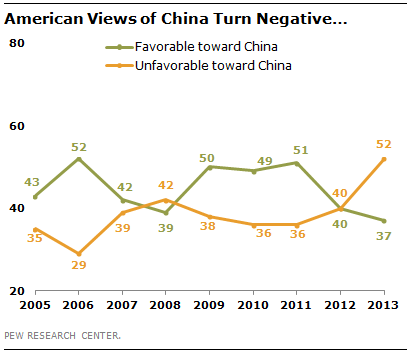 American attitudes toward China have turned sharply negative over the last two years. According to new Pew Research Center poll findings not yet released in a report, 52% of Americans have an unfavorable opinion of China, while just 37% express a favorable view. In 2011, the balance of opinion was just the opposite – 51% held a favorable opinion, while just 36% gave China an unfavorable rating. Americans are especially concerned about the economic threat from China. A 2012 Pew Research Center poll found majorities of Americans said it was a very serious problem to have the loss of U.S. jobs to China; the large U.S. debt held by China; and the U.S. trade deficit with China (the poll was conducted in collaboration with the Carnegie Endowment for International Peace and other partners – see here for more information). For their part, the Chinese increasingly see the U.S. in a negative light as well. 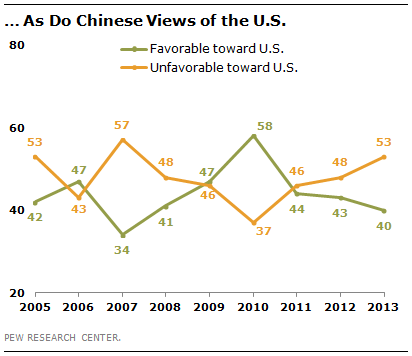 In spring 2010, a few months after a visit to China by President Obama, 58% of Chinese expressed a favorable opinion of the U.S. Today, more than half of Chinese hold an unfavorable view (53% have an unfavorable view v. 40% favorable view). Still, aspects of American soft power remain popular. In 2012, 73% of the Chinese public said they admire the U.S. for its scientific and technological achievements. And 52% of those surveyed in this one-party state said they like American ideas about democracy. Interestingly, in the 2013 poll, young people in both countries express more positive views of the other. Half of Chinese under age 30 give the U.S. a favorable rating, while just 41% of 30-49 year-olds and 27% of those 50 and older hold this view. Similarly, a 57%-majority of Americans under 30 express a favorable opinion of China, compared with 35% of 30-49 year-olds and 27% of people 50 and older.